BACKGROUND: Antimicrobial resistance and inappropriate antibiotic regimen hamper a favorable outcome in intra-abdominal infections. Clinicians rely on the minimum inhibitory concentration (MIC) value to choose from the susceptible antimicrobials. However, the MIC values cannot be directly compared between the different antibiotics because their breakpoints are different. For that reason, efficacy ratio (ER), a ratio of susceptible MIC breakpoint and MIC of isolate, can be used to choose the most appropriate antimicrobial. MATERIALS AND METHODS: A prospective, observational study conducted during 2015 and 2016 included 356 Escherichia coli and 158 Klebsiella spp. isolates obtained from the intra-abdominal specimens. MIC was determined by microbroth dilution method, and ER of each antibiotic was calculated for all the isolates. RESULTS: For both E. coli and Klebsiella spp., ertapenem, amikacin, and piperacillin/tazobactam had the best activities among their respective antibiotic classes. DISCUSSION: This is the first study calculating ER for deciding empiric treatment choices. ER also has a potential additional value in choosing the use of susceptible drugs as monotherapy or combination therapy. A shift in ERs over a period of time tracks rising MIC values and predicts antimicrobial resistance development. 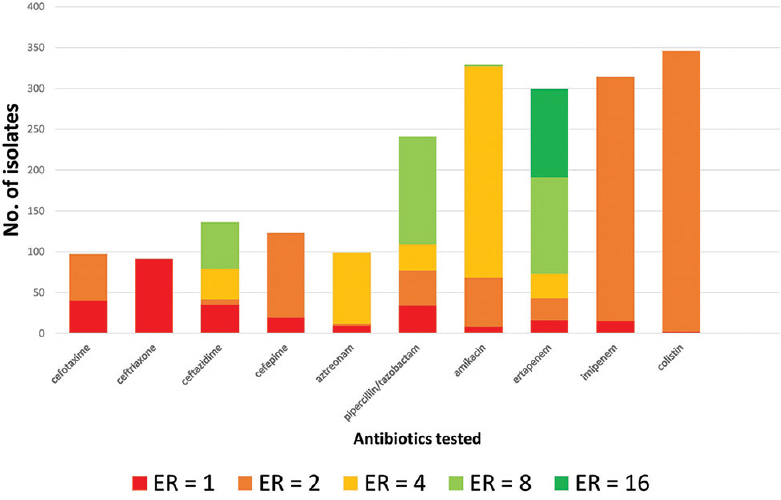 CONCLUSION: Estimation of ER could be a meaningful addition for the interpretation of an antimicrobial susceptibility report, thus helping the physician to choose the best among susceptible antimicrobials for patient management. Intra-abdominal infections encompass a number of infectious processes, including peritonitis, diverticulitis, cholecystitis, cholangitis, and pancreatitis. These are considered to be the second most common cause of mortality in the intensive care unit. Empirical treatment depends on various factors such as health-care- or community-acquired infection, organs involved, and complicated or uncomplicated infection. Apart from the surgical management, appropriate antibiotic selection for the treatment is also an important prerequisite toward recovery. Due to extensive antimicrobial resistance, the inappropriate or inadequate antibiotic regimens may hinder a favorable prognostic outcome. Antibiotics have been the cornerstone of medicine, saving many lives from serious bacterial infections. The emergence and spread of resistance to many antimicrobials among pathogenic bacteria have contributed to failure of antimicrobial therapy. Prudent use of antibiotics based on antimicrobial stewardship program guidelines contributes to decrease the problem of antimicrobial resistance. In addition, parameters such as pharmacokinetics and pharmacodynamics of drugs, microbiological culture results, antimicrobial susceptibility tests (AST), and clinical outcomes must be taken into account for streamlining antimicrobial use. The responsibility of the clinical microbiology laboratory to isolate and identify the pathogens and perform AST is decisive in patient management. Because life-threatening infections are associated with high mortality, it is vital to administer effective antibiotics without delay, which relies on rapid identification and AST. The traditional methods of AST such as disc diffusion test are labor-intensive, qualitative, and time-consuming. Many laboratories now depend on rapid, automated systems which provide the minimum inhibitory concentration (MIC) of each agent, thus overcoming these limitations. MIC is a quantitative measure of the lowest concentration of antibiotic required to prevent the bacterial growth. While it is helpful for clinicians to choose antibiotics, the numerical MIC value of different drugs cannot be compared directly to choose an appropriate drug, because the breakpoint MIC for each drug is different. Efficacy ratio (ER) of a drug can be helpful in this situation, and it is defined as the ratio of the established susceptibility breakpoint to the MIC of the organism to a particular antibiotic. Higher ER may correlate with a higher therapeutic efficacy. In this era of multidrug resistance, any delay in appropriate therapy can increase patient mortality, and ER can be used as an important tool of antimicrobial stewardship. If the prevalent local resistance patterns are known, it can be a valuable tool to decide empiric therapy as well. In this pilot study, we prospectively evaluated the ERs of various antimicrobials to treat Escherichia More Details coli and Klebsiella spp. causing intra-abdominal infections. This is a prospective, observational study conducted in the Department of Clinical Microbiology, Christian Medical College, Vellore, India. Intra-abdominal isolates of E. coli and Klebsiella spp. obtained from January 2015 to December 2016 from four different institutions in India were included in the study. The institutions were as follows: Christian Medical College, Vellore; Hinduja Hospital, Mumbai; Fortis Hospital, Kolkata; and Choithram Hospital, Indore. All the isolates from intra-abdominal infections (fluid/tissue obtained from the peritoneum, gall bladder, liver, colon, or pancreas) were identified using the standard procedures. MIC was determined using custom dehydrated Microscan broth dilution method. Quality control (QC) was performed each day along with the clinical isolates by testing the Clinical and Laboratory Standards Institute (CLSI) recommended QC strains E. coli ATCC 25922, E. coli ATCC 35218, Pseudomonas aeruginosa ATCC 27853, and Klebsiella pneumoniae ATCC 700603 (extended-spectrum beta-lactamases positive control). The clinical isolate results were considered only if the QC strain MICs were within the acceptable ranges. The susceptibility was interpreted according to the breakpoints provided by the CLSI guidelines for the respective years. For colistin alone, the EUCAST guidelines for the respective years were used for interpreting the susceptibility. After obtaining the MIC value, ER for each antibiotic was calculated using the formula; ER is the ratio of susceptible MIC breakpoint and MIC of the isolate. The breakpoint MIC value for each antibiotic was obtained from the CLSI guidelines for 2017. The total number of isolates included in the study was 514, of which 356 (69.3%) were E. coli isolates and 158 (30.7%) were Klebsiella spp. isolates. Meropenem was only tested against the isolates obtained in 2016, which were 152 E. coli isolates and 69 Klebsiella spp. isolates. When resistant to an antibiotic, the strain had an ER of <1, and when susceptible, the strain had an ER of ≥1. ER ≥2 was taken as an arbitrary cutoff to assess the effectiveness of a drug as monotherapy. ER ≥2 indicated that there was ≥1-fold difference in dilution between the MIC of the isolate and the breakpoint MIC value. Among the E. coli isolates susceptible to any antibiotic, ER ranged from 1 to 16. The distribution of the E. coli isolates based on ER of each agent is shown in [Table 1]. The distribution of the E. coli isolates susceptible to each drug is depicted in [Figure 1]. For E. coli, it was noted that carbapenems had the most activity. Among them, ertapenem was found to be better with an ER of 8 or 16, for majority of the isolates. It was followed by meropenem with an ER of eight for 79% of the isolates. Moreover, imipenem showed borderline activity among 84% of isolates. Within aminoglycosides, amikacin had an ER of 4 in about 73% of the isolates. For colistin, most isolates were susceptible, but with an ER of 2, it was predominantly borderline activity. Piperacillin/tazobactam showed better activity than other members of the β-lactam family such as aztreonam. Among the cephalosporins, the choice of drugs was ceftazidime followed by cefepime and then cefotaxime. Both levofloxacin and ciprofloxacin showed no activity against all the E. coli isolates. Among the Klebsiella spp. isolates susceptible to any antibiotic, the ER ranged from 1 to 16. The distribution of all the Klebsiella spp. isolates based on ER to each agent is shown in [Table 2]. The distribution of the Klebsiella spp. isolates susceptible to each drug is depicted in [Figure 2]. For Klebsiella spp., among carbapenems, ertapenem led the class with an ER of 8, followed by meropenem with an ER of 4, and imipenem showed borderline activity. Maximum number of isolates showed susceptibility to colistin; however, it was borderline activity. Among aminoglycosides, amikacin appeared to have good activity with an ER of 4. Of the cephalosporins, ceftazidime had distinctly better activity than cefepime and cefotaxime. Almost all the Klebsiella spp. isolates were resistant to fluoroquinolones, levofloxacin, and ciprofloxacin. The rising antimicrobial resistance among Gram-negative bacteria has left clinicians with limited options for the treatment of serious infections. In such situations, prompt therapy guided by MIC plays an important role in ensuring a favorable outcome. While assessing the different MIC values and selecting the antibiotic with the lowest numerical MIC value for treatment helps, calculating the ER gives much clearer information. ER aids in outlining the order of preference among the susceptible drugs. The drug with a higher ER should be more effective than a drug with a lower value. It has additional significance in predicting the preferred antibiotic within and among the different classes of antimicrobials. Furthermore, the site of infection, the safety, ease of use, and cost of each agent against each pathogen must be deliberated while determining the optimal antibiotic. This could be the preferred approach in formulating the antibiotic policy and standard treatment guidelines for any institution or region, derived from their own ER data. This is the first study to estimate ER using MIC value for predicting the treatment choices. In this study, for both E. coli and Klebsiella spp., ertapenem appears to have higher ER among the carbapenems, followed by meropenem. Imipenem has borderline activity against both the organisms. Hence, its use as monotherapy should be considered with caution. Amikacin shows consistently good action against both the organisms, among aminoglycosides. Although almost all isolates show susceptibility to colistin, alarmingly, it was entirely borderline activity. Thus, the judicious use of colistin is necessary to prevent the imminent development of resistance. The β-lactam/β-lactamase inhibitor, piperacillin/tazobactam, and the monobactam/aztreonam have moderate activity against both E. coli and Klebsiella spp. Among the cephalosporins, ceftazidime appears to be better than cefepime and cefotaxime. However, ceftriaxone shows poor activity against both the organisms. The fluoroquinolones, levofloxacin, and ciprofloxacin did not have any role against the two organisms. Overall, the knowledge of ER for various antimicrobials plays a crucial role in deciding empiric therapy in various clinical situations. Shift in ERs over a period of time may also help in tracking the rising MIC values and predicting the development of antimicrobial resistance. ER has a potential added value in predicting the use of susceptible drugs as monotherapy or combination therapy. For this, we hypothesize that agents with an ER ≥2 can be used as monotherapy and drugs with an ER <2 would work as a combination therapy for favorable outcomes. In this study, it is observed that ertapenem can be used as monotherapy, whereas imipenem can be used only in combination therapy. However, various other factors such as the presence of synergy, side effect profile, and site of infection will play an important role as well. As ER has the above-proposed advantages, clinical studies documenting patient outcomes in relation to ERs of the drugs used are needed. Clinical studies may also help decide on the ER cutoff for monotherapy and combination therapy. 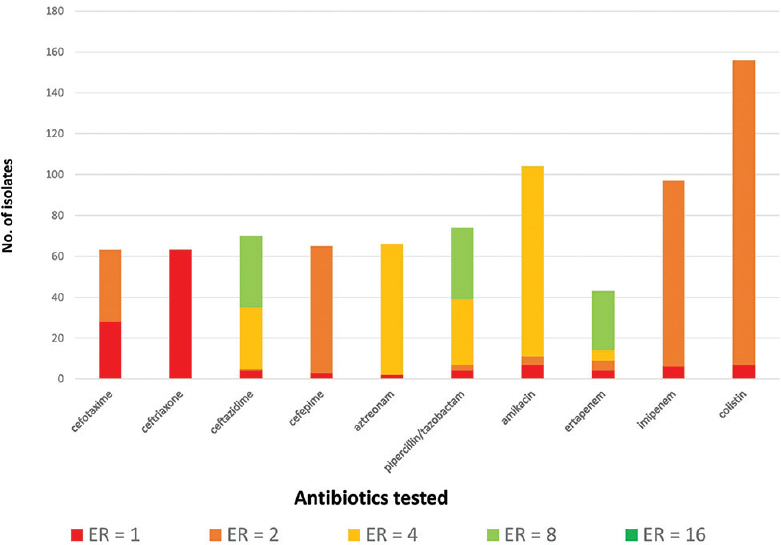 To surmise, an estimation of ER could be a meaningful addition to the interpretation of an AST report helping the physician to choose the best among susceptible antimicrobials for patient management. The potential use of ERs in predicting combination therapy remains to be explored. SMART study by International Health Management Association (IHMA), U.S.A.
Florida SG Pharm D, BCPS Clinical Pharmacist Lee Memorial Health System Cape Coral, Florida Engi Nakhla, Pharm D, CPh Clinical Pharmacist Tampa General Hospital Tampa. Intra-abdominal Infections in Adults. Available from: https://www.uspharmacist.com/article/intraabdominal-infections-in-adults. [Last accessed on 2018 Feb 09]. Diagnosis and Management of Complicated Intraabdominal Infections in Adults and Children: Guidelines by the Surgical Infection Society and the Infectious Disease Society of America.pdf. Available from: https://www.idsociety.org/uploadedFiles/IDSA/Guidelines-Patient_Care/PDF_Library/Intra-abdominal%20Infectin.pdf. [Last accessed on 2018 Feb 09]. Tsoulas C, Petrakis I, Athanasakis K, Vatopoulos A, Vagianos K. The burden of initial empiric antibiotic failure on healthcare resources for hospitalized patients with complicated intra-abdominal infections in Greece. Hell J Surg 2013;85:215-23. Lee CR, Cho IH, Jeong BC, Lee SH. Strategies to minimize antibiotic resistance. Int J Environ Res Public Health 2013;10:4274-305. Wu CT, Chen CL, Lee HY, Chang CJ, Liu PY, Li CY, et al. Decreased antimicrobial resistance and defined daily doses after implementation of a clinical culture-guided antimicrobial stewardship program in a local hospital. J Microbiol Immunol Infect 2017;50:846-56. Syal K, Mo M, Yu H, Iriya R, Jing W, Guodong S, et al. Current and emerging techniques for antibiotic susceptibility tests. Theranostics 2017;7:1795-805. DCPAH Use of Antimicrobial Susceptibility Data to Guide Therapy – Michigan State University; 2015. Procop GW, Church DL, Hall GS, Janda WM, Koneman EW, Schreckenberger PC, et al. Koneman's Color Atlas and Textbook of Diagnostic Microbiology. 7th ed. Philadelphia: Lippincott Williams & Wilkins; 2017. p. 240-1. Clinical and Laboratory Standards Institute. Performance Standards for Antimicrobial Susceptibility Testing. 27th ed. CLSI Supplement M100. Wayne, PA: Clinical and Laboratory Standards Institute; 2017. Microbiology Guide to Interpreting Minimum Inhibitory Concentration (MIC) – Diagnostic Update; March, 2017.